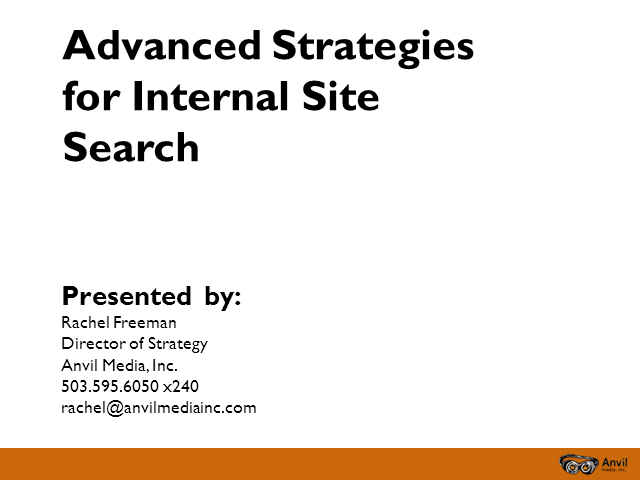 Internal Search - Your Secret Weapon. One of the most underrated features available in analytics – internal site search. There is so much more than just knowing what keywords users are searching once they land on your site, so much insight to be gleaned. Is your internal site search optimized? Are users looking for products, services and information you don’t offer? Are users looking for information you already have, but it is not easily found? All this and much more will leave you inspired to dig deep and get to know how users are truly interacting with your site. Since 2012, podcasts have been growing, both in popularity and as a strong engine for advertising dollars. There are a huge number of podcast listeners that did not like podcasts in 2012 that are now avid listeners. With podcasting becoming a hobby turned career for a lot of people in the past several years, advertisers have started seeing their ROI increase, resulting in advertisers putting even more money into the pot. Whether you’re a brand looking to start a podcast or sponsor one, you need to get involved in the craze that is podcasting. Anvil Media’s Social Media Specialist, Terran Benedict, shares best practices for creating your brand’s podcast, or sponsoring another branded podcast, to uncover new hyper-active consumer audiences. With 5 years of professional social media marketing experience, Terran has developed and managed social media strategies across a multitude of industries in both B2C and B2B. What are the KPIs that matter in 2016? How do brands and agencies show their results, and what ultimately counts? As President and Founder of Anvil Media, Inc., Kent Lewis is responsible for ensuring the company is living its mission and vision by managing overall corporate strategy including operations, business development, sales and marketing. With a background in agency-side digital marketing, Lewis regularly speaks on effective digital marketing techniques & trends to audiences as a subject matter expert. Since 2000, he’s been an adjunct professor at Portland State University, where he teaches an SEM Workshop, and also toured nationwide with Online Marketing Institute as a lead instructor. Lewis also regularly contributes to industry publications including Business2Community and iMedia Connection. As a long-time entrepreneur, he’s an investor and advisor to a host of emerging Portland-based companies, including DreamPath, Gas Anywhere, Journey Fitness, RISEcx, Syndical and Tixie and Workplace Resource of Oregon. Lewis is co-founder of a variety of organizations, including career community pdxMindShare, eROI and SEMpdx, a Portland-area professional trade association for search engine marketers. Active in his community, he’s currently involved in non-profit charity and professional trade organizations including early literacy program SMART (Start Making a Reader Today), The Entrepreneurs’ Organization (EO), Portland Incubator Experiment (PIE) and others. Lewis’s industry recognition and awards include Portland Business Journal’s Top 40 Under 40 Award, Top 25 Most Influential Pay-per-Click Experts and American Marketing Association Oregon Chapter Marketer of the Year in 2012 and Top 20 Digital Marketing Strategists 2015. What changes have you made your website lately? Sometimes incremental changes do the trick to keep your website up to date and other times a full redesign is needed. Learn how a cross-functional team from BrightTALK worked with search engine marketing agency Anvil Media to identify opportunities for improvements and ultimately redesign the website. Take a sneak peak at the new designs for the BrightTALK website that are better optimized for search engines and user experience. Albert Einstein once said “Everything that can be counted does not necessarily count; everything that counts cannot necessarily be counted.” In this webinar, we’ll try to decrease the gap between those two concepts to identify metrics that count and turn them into actionable insights for your business. Make sure to bring your analyst hat as we’ll take a look at the power of cross-channel analytics, attribution modeling and deep dive data analysis. This webinar will focus on taking a deeper look into top tier social platforms including Facebook, Twitter and LinkedIn. Learn tips and tricks to fully utilize these platforms and make them work for your business. Major search engines are placing more and more of an emphasis on localized search results, and often local listings will show over the main company website listing. Recent statistics show that 20% of searches are done with local intent, and on mobile that number jumps to 53%. This webinar will go over local SEO best practices on and off your website. Where to Find Leads and How to Nurture and Convert Them. Leads are everywhere, just waiting for you to find them! They are using search engines to find you, reading articles and blog posts about you, visiting your site, and downloading your whitepapers. Nick Footer, Business Development Executive at Anvil Media, will outline which online marketing channels generate quality leads and provide the newbie and advanced marketer strategies and tactics per channel. Then Jeff Linton, Senior Manager, Product Marketing at Act-On, will provide ways to nurture and convert those leads through marketing automation. Do you know what your competitors are doing online? You may be surprised who your true online competitors even are. In the digital space, a competitor can be anybody who takes visibility away from your online properties regardless of the services they offer or products they sell. Today more than ever it’s important for business owners and marketers alike to be aware of the competition—who they are, what they’re doing, and where they’re doing it. We’ll teach you how to stay on top of your competitors by leveraging today’s tools and technology. In the digital world, consumers own brand management. By posting positive (or negative) reviews and blog posts, consumers become a sales enabler (or preventer). Customer reviews are particularly critical influencers in the hospitality space. Hotels and restaurants can be made or broken by even a single review from a person of influence. While customers have a louder voice than ever, there is opportunity awaiting hospitality brands that embrace search engine and social media marketing to help manage their brand and reputation online. Kent Lewis, President and Founder of Anvil Media, will outline effective strategies, tactics and tools for online brand management. Learn how to turn positive (and negative) reviews into real revenue. Corporate America is rapidly adopting and embracing social media as a communication and collaboration platform. As more companies engage prospects and customers via social platforms, however, the noise is increasingly difficult to cut through. Kent Lewis, President & Founder of Formic Media will outline the advanced content strategies, management tools and marketing techniques for popular social platforms like Facebook, Twitter, LinkedIn and YouTube. Lewis will also describe a handful of emerging platforms like Quora, SlideShare and trends like location-based mobile services. >From this presentation, you will be armed with the inspiration and tools to take your current social media strategies to the next level. Let's face it - your marketing budget doesn't always increase like you'd hope it would. But what if there was a way to increase your website's revenue without having to spend more money driving additional traffic? You can! Nick Herinckx of Anvil Media will highlight conversion optimization best practices designed to leverage existing visitors by turning them into customers. NOTE: Image on slide 18 and L.I.F.T methodology is provided by WiderFunnel. So far, 2011 is shaping up as the "Year of Mobile." For those of you that agree with the prediction that mobile marketing is finally here, this webinar will explore the key trends and tactics to improve your mobile marketing effectiveness. Kent Lewis, Anvil Media President, will explore how mobile marketing fits into your marketing mix, focusing on mobile web design, local SEO, mobile advertising, location-based services, SMS/e-mail and mobile applications. Register, attend and build a foundation for your mobile marketing strategy. Founded in 2000, Anvil Media, Inc. is a search engine marketing (SEM) agency specializing in search engine optimization (SEO), pay-per-click (PPC) management, online reputation management (ORM), social media marketing (SMM) and analytics & conversion optimization services. Anvil helps build its clients’ businesses by applying a breadth of SEM strategies and tactics, as well as a unique background in marketing and e-business consulting. Anvil’s overall vision is to be the most respected SEM firm in the world. Title: Internal Search - Your Secret Weapon.